The changes to the aerospace standards are significant and will dramatically affect most organizations. When combined with the required approach defined in AS9101, the changes are truly sweeping. In this two-day training, attendees will learn what those changes are and how to effectively address them in their organization. With the introduction of the revised aerospace standards and the completely different audit methodology defined in AS9101D, it is anticipated that many organizations, if not most, will struggle to meet the new requirements. In order to enable military, defense, and aerospace organizations to succeed Eagle Force has decided to release a series of informative messages that will provide tips and guidance. As they are released they will be posted on our website. Check back each week for new guidances. If you have questions as you read these Guidances or want to discuss an approach, click the icon on the left to contact us and one of Eagle Force's certified aerospace auditors will contact you. Want to receive these guidances directly? Complete the fields below and we'll send all future guidances directly to you. You can opt out at any time. Organizations need to focus their attentions beyond whether their developed and documented systems meet the requirements of the standards and begin to focus heavily on whether those systems are truly effective. There is a difference in system effectiveness and process effectiveness, which we will discuss in Guidance #2, but for now let’s look at what system effectiveness really means. The management system, the sum total of all the processes, needs to deliver a quality product or service in the timeframe the customer is expecting. Of course if you want to stay in business it would be a good idea to be making money while you are doing this. So system effectiveness could be measured in terms of quality, delivery, and cost. I am a certified aerospace auditor and successfully completed the upgrade training. In order to qualify as an aerospace auditor for these new standards, all the registrars' auditors must take and pass the on-line and classroom training and testing. Much of the training was focused on how to audit for effectiveness, both process and system effectiveness. An organization's internal auditors will also need to be retrained to be qualified to perform audits to these new standards. What auditors are going to be looking for is how an organization collects, evaluates, and responds to customer metrics on customer satisfaction especially quality and delivery performance. At a minimum there needs to be a year’s worth of data that shows evaluation for trends. The auditors are also going to be looking to see if there is a robust plan in place to address any deficiencies identified by these metrics. They are not allowed to accept the plan unless there is supporting evidence that the plan is actually improving the customer satisfaction metrics. As you can see, this is a whole different animal than what the previous aerospace audits were about. The aerospace industry is expecting many suppliers to have serious issues at the audits. At Eagle Force, our position is that you can and should be successful but you need to prepare now. Contact us and we would welcome the opportunity to be part of your success. As we found out in the last guidance, AS9101D is going to require a seriously different approach to how organizations handle system effectiveness. In other words, your current system isn't going to meet the requirements of AS9101D without some modifications. In the last message we also learned that customer satisfaction metrics have gained a whole new importance in the new standard. In fact, your entire system could fail the audit if customer satisfaction metrics are not handled properly. 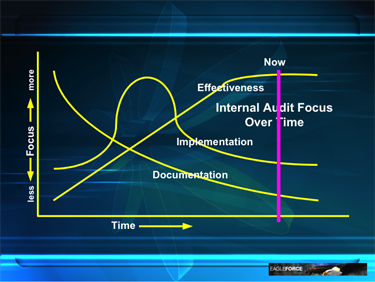 In Guidance #1, we discussed what system effectiveness means and what auditors are going to be looking to see. We learned that essentially auditors are going to be looking for evidence that you are shipping good product on-time and hopefully controlling costs while doing it. In this installment we will look at what process effectiveness means. A great deal of emphasis is about to be placed on process effectiveness in all upcoming certification and surveillance audits. In fact the aerospace industry, the accreditation bodies and the registrars are expecting to see more performance-based nonconformities issued than conformance-based, which we will discuss in Guidance 3, but for now let’s concentrate on process effectiveness. Many organizations confuse system effectiveness with process effectiveness, system inputs and outputs with process inputs and outputs. The management system is the sum total of all the processes. So system effectiveness measures, such as on-time delivery and customer quality satisfaction metrics are the result of all the processes working together, some effectively, some not so. Rarely can a process point to a system metric such as on-time delivery as a true measure of its effectiveness since other processes actually impact that metric. Instead, you must take the time to carefully analyze your management system, identify what processes it contains and how those processes interact. There is no mandatory method for doing this. Some organizations use a turtle methodology; Eagle Force has developed our own proprietary tool, the Process Evaluation Matrix, that we think works much better for managing these interactions and metrics. Whatever the method, your organization needs to be able to clearly show how processes interact and point to which ones affect which system objectives. We will discuss the reason for this when we talk about the system objectives in a later Guidance. This will prove to be a difficult, multi-disciplined, and probably frustrating task, but it will be worth its weight in gold if you do it right. Don’t put it off! If you haven’t already, get started now. As we found out in Guidance #1, AS9101D is going to require a seriously different approach to how organizations handle system effectiveness. In other words, your current system isn't going to meet the requirements of AS9101D without some modifications. In Guidance #2 we also learned there is a difference in system effectiveness and process effectiveness. The vast majority of organizations are going to need to do considerable work to be successful with these new requirements. In most current and past audits all nonconformances issued by auditors were by definition conformance issues. For example, either our processes did not conform to the requirements listed in the standard or we did not conform to our defined processes. Perhaps we did not adhere to the internal audit schedule or we had several gages that somehow escaped the calibrated system and these conformance issues ended up as Corrective Action Requests, major or minor. What is expected to become the new norm is that most Corrective Action Requests are going to be performance issues not conformance. In other words the emphasis on the audits is going to change from complying with the standard to being able to justify that your processes are functioning effectively, all of them, individually. No more disguising a lack of a robust process management by pointing to a system objective. At a minimum the aerospace auditors are going to be required to complete a Performance Effectiveness Assessment Report (PEAR) for each process defined in clause 7, i.e. Production Planning, Configuration Management, Sales, Design, Purchasing, Production, etc. The PEAR is designed to force the auditor away from clause-base auditing and focus on how effective is the process in achieving the defined goals. The use of the PEAR will be further discussed in a later Guidance. In Guidance 2, we discussed defining processes and one of the things that we listed was Controls. What are the controls for each process? What are you monitoring and measuring for each process? Can you show objective evidence that you are meeting those requirements? If you are not meeting those requirements, is there a robust corrective action plan in place to fix this? If you have a negative response to any of these questions you are likely looking at a performance-based corrective action request, major or minor. Even the way corrective action requests are being handled is changing and becoming much more stringent. Corrective Action Requests will be covered more fully in a later Guidance. As you can see, this is a whole different animal than what the previous aerospace audits were about. The aerospace industry is expecting many suppliers to have serious issues at the audits. At Eagle Force, our position is that you can and should be successful but you need to prepare now. Contact us and we would welcome the opportunity to be part of your success. Don’t gamble with your organization’s success; we have the tools and the experience to equip you to meet these challenges, but contact us today. The clock is ticking. As the previous guidances have shown, AS9101D is going to require a seriously different approach to how organizations handle system effectiveness. In other words, your current system isn't going to meet aerospace requirements without some modifications. The vast majority of organizations are going to need to do considerable work to be successful with these new requirements. Be sure to read each of the guidances here as they contain information you can’t afford to miss. In Guidance #3 we looked at the difference between conformance and performance and how audit emphasis is changing. This is going to be very evident in the way the topic of Guidance #4 is about to be addressed. Are the objectives the right objectives? Is there a formal plan to accomplish the objectives? How are the results trended? Are there effective corrective actions if the results are not meeting the goals? In the past, these were not a big deal. Now any lack in this area will very likely be a major finding. Further, auditors are being instructed to see how organizations have identified which processes affect system objectives, which we will discuss in a later Guidance. This, of course, presents obvious audit trails. AS9101, the standard auditors must use to conduct all aerospace audits, defines six recommended audit methodologies, which we will look at in some depth in future Guidances. In Guidance #4 we looked at how top management’s objectives are going to be playing increasingly bigger roles in the way aerospace management systems are managed and audited. In Guidance #5 we want to take a look at the timing by which all this needs to take place. What this means is that any audit preformed after July 1, 2011 must be to the new AS9100 & AS9110 revisions and using the AS9101 rev D.
This presents some interesting options. Well, the first is that if you are not already furiously working on upgrading your system, you may be cutting it very close, but secondly you may want to consider your options and plan ahead. For example, if your audit is scheduled the first week of July, you have no choice; you better be ready. If however, you move up your audit to June you just bought some time before you have to go to the new requirements. Be aware though that thousands of organizations have thought about this, or should have. If you wait, you may not have the options of changing your audit date. Thinking of switching registrars? There are some interesting requirements regarding that that we will be discussing at a later date. While there are many changes and new requirements in the revised aerospace management systems, few will be as daunting as establishing a truly effective process management system. In the past, organizations and auditors were focused on whether processes and systems were formally established and adequately documented. Well, that is a given now. What is going to be looked at with real scrutiny is how effective are those processes working toward accomplishing the objectives. Most organizations have not been, nor are clear on how to monitor/measure the effectiveness of individual processes let alone relate those to metrics to the overall objectives. In the next several Guidances we are going to take a look at how this might be done in a way that makes business sense. We will want to talk about the differences between system processes and the system infrastructure. In the past, emphasis was on infrastructure. Now it is going to be on performance, on processes. As AS9100 certified organizations, we have to be able to demonstrate that we know exactly what our processes are, what they should be accomplishing, and have the data on hand to show they are being effectively managed. We are going to call this a baseline. How does this baseline compare with what your organization’s management expects? Most importantly, how effectively is this baseline pleasing your customers? What actions should we be taking to improve the baseline? Do we have formal programs that do just that? While of course there are additional requirements in the revised AS9100 standard, which we will be taking a look at in later Guidances, I think the main paradigm shift is the new focus on system & process management. As we discussed in Guidance #2, there are six main attributes to each transformation process: inputs, outputs, resources, personnel, methods, and controls. Each of these attributes needs to be clearly thought out in every organizational process. Eagle Force has developed some proprietary tools that enable organizations to identify these processes and their characteristics. One of the challenges that we have faced in many organizations is breaking a silo mentality regarding process management. Many organizations are compartmentalized with each specialized process establishing their own criteria for success quite apart from the processes up or down stream. Most organizations, when pressed, can identify a metric or group of metrics that defines how effective a process is operating. The difficult thing is to identify the correct metric, which is not necessarily the obvious one. We were working in one aerospace manufacturer that was struggling with on-time delivery. Upon review we found manufacturing working overtime and using expedited shipments to minimize customer dissatisfaction. Eventually we discovered that orders often languished in the front office for weeks before they even got to Scheduling! Their Order Review process, clearly disassociated from the rest of the organization, had no idea they were wasting away the cycle-time and causing late deliveries. When defining the processes that make up your system, you will find primary, secondary and direct support processes. It is essential, particularly on the primary processes, that you focus on upstream, downstream, and system requirements. If you do not then the metrics you will be tracking will likely not be the ones that truly effect system performance. You want the Shipping Department to be cognizant of goals other than to ensure the trucks are full when they leave, for example. In the next Guidance we will take a look at two of the attributes of a process: Methods and Controls, discuss the difference, and tie that into AS9100, clause 8.2.3 Monitoring and Measurement of Processes. As we discussed in Guidance #7, there are six main attributes to each transformation process: inputs, outputs, resources, personnel, methods, and controls. Each of these attributes need to be clearly thought out in every organizational process. Eagle Force has developed some proprietary tools that enable organizations to identify these processes and their characteristics. Two of the attributes of an adequately defined process are Methods and Controls. We want to take a moment to look at these because our experience is that organizations struggle with these, or at least the understanding of what these terms mean. Methods are the formalized way a process is to be operated/managed. Nearly all organizations have Methods defined for their primary processes and these methods are often defined in procedures, work instructions, routers, travelers, visual aids, etc. So initially it is not so much an effort to create Methods but to identify the current methods being used to ensure the process works effectively and capture this information. Controls on the other hand are much harder to nail down. From experience you’re going to struggle with this and we have found that this is best done in a cross-functional environment. What are Controls? Controls are the metrics that you are monitoring/measuring/analyzing to ensure the process is functioning effectively. Controls for a metal stamping process might include a measure of throughput, timeliness, scrap, job changeover time, 1st piece acceptance rate, manpower utilization, etc. The relevance here is that should the Controls indicate that the process is not as effective as it should be there is almost always going to be a requirement to change the Methods. When the Methods are changed we should see a commensurate change in the metrics the Controls are measuring. In the Process Effectiveness Assessment Report (PEAR) auditors are required to ensure that this is indeed happening. Should a process be found operating ineffectively but there is evidence that a robust corrective action is in process to adjust the Methods with the Controls measuring the results, aerospace auditors have the option to, in effect, give it a pass while it is being corrected. They will certainly revisit this at a later date to ensure the process becomes effective. One of the challenges that organizations face is that many processes are set up in a silo environment. In the next Guidance we want to look at a method to break that. A very interesting aspect of this revision to the AS standards including the AS9101 is that nearly all preparation, guidance, and training by the aerospace industry have been geared toward getting the aerospace auditors up to speed on the new requirements. I think it is significant that virtually no assistance has been offered to the thousands of organizations that have to comply with these requirements. Hopefully these Guidances will be helpful to the thousands of organizations that are receiving them. In the last Guidance we discussed process management and the difficulty organizations are having in developing true process management systems. We defined the six primary attributes of a process and identified a stumbling block of looking at the processes with a silo mentality. It is very possible to identify all six attributes of a process but miss the key performance metrics altogether. (We will discuss Key Performance Metrics, KPI’s, in another Guidance). Purchasing may very define all six of its attributes but not stop to consider the upstream and downstream processes. A key to breaking this silo mentality is to get the process owners to consider not only the inputs and outputs of their process but identify the needs of the supplier of the inputs and the customer of the outputs. Ask yourself if the Controls monitor/measure the satisfaction of the supplier & customer of that process. In fact one of the tools Eagle Force has developed and found to be effective helps to map out the processes in this fashion. The process supplier and customer are identified. It can be informative to leave a process that considers itself effective and go downstream to the next process, the customer, and ask them if they feel the identified process is effective. A cross-functional team is excellent for this kind of development. In the end it is going to come down to defining and managing process effectiveness. The audit process will be all about ensuring this is done. One of the critical activities you will need to do is to identify and monitor/measure and analyze the key effectiveness criteria. While there are a number of ways to do this one of the most effective is to establish and manage by Key Performance Metrics, KPI’s. What is a KPI? As the name implies it is a KEY characteristic. These are sometimes called dashboard gages. Looking at a car, for example, all kinds of information could be reported via dashboard gages, but usually only the key or critical ones are there to avoid informational clutter. I suppose you could have a gage that would tell you the temperature of the trunk space, but who cares? However you probably would like to know how fast you’re going, or whether there is any gas in the tank. The auto industry has picked the KPI’s for you. A glance into the cockpit will tell you that the airplane has a few KPI’s also. What are the KPI’s for your processes? What do you need to know to ensure the process keeps operating effectively? What kind of alert do you want if things start to go wrong? The idea of the dashboard gages is that you fill it up before you run out of gas or if the engine is overheating you know it before it seizes. KPI’s work the same way. My business partner, a guru in productivity improvements, would tell you that if you are not driving with the dashboard gages you are driving using the rearview mirror. That, my friend, will get you into the ditch before you know you have a problem. The ISO 9001 standard is on a 6-8 year revision cycle (original issue 1987, first revision 1994, and second revision 2000), and now the latest and third revision, is ISO 9001:2008. Since ISO 9001 is embedded word-for-word in the aerospace standards, the release of ISO 9001:2008 triggered the release of the latest revision of the aerospace standard, AS9100, earlier this year. With this release AS9100B is replaced by AS9100C. While ISO 9001:2008 is virtually the same as ISO 9001:2000, the same is not true for AS9100. AS9100C is considerably different than the prior issue, AS9100B. Start with the title. AS9100B was titled “Quality Management Systems – Aerospace – Requirements” and AS9100C is now titled “Quality Management Systems – Requirements for Aviation, Space and Defense Organizations”. In other words, the scope of application of AS9100 has grown considerably from strictly aerospace to include defense ground and sea bound equipment. Defense organizations and suppliers not involved in aerospace weren’t impacted by AS9100, but with the issuance of AS9110C that is no longer true. It can reasonably be anticipated that defense customers will begin to require AS9100 compliance by their suppliers in the near future. We are seeing many military organizations seeking certification to AS9100/AS9110 themselves with the aim of competing for commercial work and they are indeed getting the work. It is reasonable to expect the military and therefore the huge defense industry to start demanding AS9100/AS9110 certification of their suppliers. The opportunities here are obvious. ISO 31000 gives guidance on a risk management program: “While all organizations manage risk to some degree, this Standard establishes a number of principles that need to be satisfied before risk management will be effective.” The aerospace industry expects organizations to integrate the process for managing risk into the organization's production planning process to ensure that good product is going to be delivered at the agreed upon delivery date at the expected price. Although this is a brand new requirement, it is not necessary to reinvent the wheel here. Eagle Force has developed a risk management process with usable, understandable forms. Let us help you with this one. An organization that hopes to compete in this competitive market place will be constantly monitoring/measuring the system performance. Not only will they be comparing their quality, delivery, and cost to what customers expect but also to what the competition is able to do. The old adage that you don’t have to out run the bear, just the other guy that’s also running is pretty true with your business. If your competition is outrunning you, the bear is not far away. Organizations that are continual industry leaders are constantly remaking themselves and improving the big three: quality, delivery, and cost. The only way any organization can improve their system is to improve the individual processes. Sometimes that can be painful and often have a domino effect on other processes, but the results can be dramatic. Mr. David Adams, president of Applied Thin-Film Products, an Eagle Force client spoke to me about their efforts to improve their processes. Applied Thin-Film Products, located in the San Francisco bay area is a dynamic high-tech company focused on meeting customer expectations. David said that optimizing their processes reminded him of when he used to build hot-rods. He would get the engine souped-up and then it would blow out down stream processes like the clutch or rear end. The analogy is pretty sharp because as you get a process operating at a new level, it can often overwhelm downstream processes which then give you the opportunity to upgrade those. The end result is that you have a system that moves faster, does it better, and runs leaner, cheaper. Another major change is the expansion of 7.1.3, Configuration Management. Instead of just requiring a Configuration Management program, AS9100 rev C and AS9110 rev A and for the first time, AS9120 rev A, spell out what the contents of the configuration management program must contain. These new aerospace standards bring the requirements of ISO 10007 into the standards and make it an auditable requirement. While it is true that since Configuration Management was moved from clause 4.3 to 7.1.3 it can be excluded, most organizations are going to have a very tough time justifying that exclusion. Configuration Management Plan - The standard states “configuration management planning is the foundation for the configuration management process…. The output of Configuration Management planning is the Configuration Management Plan” The auditors are going to ask to see your plan and will audit it for effectiveness. Configuration Identification - Configuration items should be identified using established selection criteria and used to establish the baseline. Details of how the change should be implemented and verified. Configuration Status Accounting – Configuration status accounting activity results in records & reports that relate to how a product related to the baseline. A physical configuration audit; this is a formal examination to verify that a configuration item has achieved the physical characteristics specified in its product configuration information. Organizations can expect to have much more in-depth Configuration Management audits under the new revisions that they have seen in the past. As we have discussed all along in these Guidances, auditors are being retrained to focus on system and process effectiveness rather than just focusing on conformance. Regardless of whether your organization is AS9100, AS9110, or AS9120 these are the auditing methods that will be used to assess your system. AS9101 rev D outlines 6 auditing methods that auditors are expected to use in all the audits. We want to take a look at some of them because they represent significant departures from previous audit methods. Organizational Leadership is an audit methodology that must be used in every audit. As the name implies the audit is to involve the top management of the organization or site and it is going to focus on how the organization is performing against customer expectations and how specific processes are contributing or detracting from that performance. Organization’s goals – are they consistent with customer expectations? Are they measurable over time? Are they currently being tracked? Are they on target? What is the plan for accomplishing them? What processes are identified as affecting specific objectives? Is the plan in place and working? Organization’s processes – how are the processes performing? Are they operating effectively? If not, are there corrective actions in place? Tough questions. Your top management is going to look poorly unless you adequately prepare them. I strongly suggest that you not let them be skewered by these questions. Few organizations have been adequately prepared to answer these kind of audit questions, but then again auditors never asked these kind of questions before. They will be asking now and they have been instructed to write findings against top management if these are not adequately answered with objective evidence. These evaluations are supposed to be based in part on customer scorecards and any related OASIS feedback (which we will discuss in a future Guidance). Further the audit team is supposed to evaluate what actions your organization is taking to address any deficiencies in these areas. Customer Focus is intended to be a process audit and it stands to reason that the audit team would be looking to see how you drive down to the process level any corrections needed. Audits like these have very rarely been done in the past, so establishing a robust and effective process management system will be key to success. How are your processes tracking against targets? How are your objectives tracking? So we are brought right back again to ensuring that we have robust process management system. Industry has rarely, if ever, seen audits like this. You need to seriously consider how you will fare and prepare carefully. As we found out in the previous guidances sent, the revisions to AS standards are going to require a seriously different approach to how organizations handle system effectiveness. In other words, your current system probably won’t meet aerospace requirements without some modifications. The vast majority of organizations are going to need to do considerable work to be successful with these new requirements. Contact us and let us help you. I was a speaker at the International ISO 9000 Conference in San Antonio last week and had occasion to talk with many folks who are currently AS9100:B/AS9110/AS9120 and was very surprised that they were under a major misunderstanding. Many thought that up till July 1, 2012 they could still opt to have the old method of auditing and only be forced to upgrade after July 2012. Not so. Any audits done after July 1 of this year must be to the revised standard & using the new methodology. To help folks, we are revisiting Guidance #5. As we have discussed all along in these Guidances, auditors are being retrained to focus on system and process effectiveness rather than just focusing on conformance. Regardless of whether your organization is AS9100, AS9110, or AS9120 these are the auditing methods that will be used to assess your system. Nearly all the efforts expended so far by the aerospace industry has been to prepare the registrars and auditors for this radical new approach and very little has been done to effectively prepare the supply base to pass these types of audits. Even so, some registrars I have spoken with are reporting 30 to 80 per cent failure rates of auditors passing the audit upgrade classes. This is forcing many auditors to study/retake the exams or find another line of work. You can check the status of an auditor by reviewing that auditor’s information on OASIS. If the auditor is not listed in OASIS, he or she is not qualified as an aerospace auditor at all. You can also tell if the auditor has passed the upgrade exam by what revision standard they are qualified to audit. There are many thousands of ISO 9001 auditors, but as of the date this is written there are only 410 certified AEA’s in America. Last week, we had a client breeze through an ISO 9001 audit. The auditor spent nearly all the audit concerned with the documentation, some on implementation, and none at all on effectiveness. I can promise you that aerospace audits will not resemble this any more at all! In the next several Guidances we will discuss two of the audit methodologies called out in AS9101: Process Management and Process Performance Effectiveness. You will see that a huge change is really coming. What the audit team is going to expect is that you have defined how you are measuring and controlling each process. What the defined criteria is for each process to be a success. What is the plan to get the process to the target? If there is a process that is not meeting the goal or target, where is the corrective action? This is hugely different from the ISO 9001 audit I described in the last Guidance and very likely different from anything you have seen to this date. The feedback I am getting from aerospace auditors is that the organizations being audited to the new revisions are not generally prepared and doing poorly. If you have been reading these Guidances, there is absolutely no reason for your organization to be caught off-guard or surprised, but you have to take advantage of all the time you have to get them prepared. As we have discussed all along in these Guidances, auditors are being retrained to focus on system and process effectiveness rather than just focusing on conformance. Regardless of whether your organization is AS9100, AS9110, or AS9120 these are the auditing methods that will be used to assess your system. One of the critical abilities any organization needs to develop is good problem solving skills. Auditors and especially customers are going to be expecting organizations to have effective corrective action systems. This is a critical skill that the aerospace industry is zeroing in on and forcing their suppliers to develop. How effective is your corrective action process? Do you see repeat problems? Do you have a disciplined problem solving method that you can teach your organization to use to solve problems once and for all? Like most organizations, do you struggle with ‘root cause’? I invite you to look at a whole new problem solving methodology. Visit www.eagleforceinc.com/wholebrain You will find a method described that can provide dramatic improvements for your organization and your career. As the aerospace industry goes through quite a revolutionary change in the standard and auditing methods, opportunities are going to present themselves. You can position your organization to thrive in this time of change or let the change run you down. The tools you will gain the Whole-Brain Problem Solving Workshop will equip you to succeed. Contact us and we would welcome the opportunity to be part of your success. Don’t gamble with your organization’s success; we have the tools and the experience to equip you to meet these challenges, but contact us today. The clock is ticking. If you can’t answer that question and prove it with company level data, you have some work to do in order to be ready. That doesn’t mean that you have to nail all the KPI’s to pass an audit, but it does mean that you must be taking action with processes that are not yet achieving their KPI’s. Are processes identified and appropriately defined? Are sequence and interactions defined? Are relevant process controls defined? Are there resources available to manage the processes? Are the processes monitored, measured, and analyzed against planned results (KPI’s)? Are corrective actions being taken for processes not achieving the KPI’s? Is there evidence of continual improvement of processes that are achieving their KPI’s? Auditors will not be tolerant with CAPAR (Corrective and Preventive Action Request) processes that are not working. So what does that mean? Well, first, it means that you must be identifying current and potential problems in your CAPAR process. We find most organizations only use their CAPAR processes for recording audit nonconformances and responses to those nonconformances. Most organizations don’t even think of the CAPAR processes as their primary vehicle for permanently solving the problems. If fact, I recently had a Plant Manager say to me, “Our corrective action system doesn’t have anything to do with solving problems, we solve many problems everyday!” The truth is they weren’t solving any problems, because the problems were repeating over and over. If he were to use the CAPAR processes as they should be used, they would get to the true cause(s) of the problems and eliminate them. This would result in his plant having lower costs (less scrap and rework), quicker delivery and fewer customer complaints (from escapes). In other words, his CAPAR processes would be much more effective, and that is what the auditors are being forced to require in the latest revisions of the Aerospace standards. Be forewarned, auditors will be insisting on CAPAR processes that are effective in eliminating and avoiding problems and that result in higher quality and quicker delivery. Will your CAPAR process meet these requirements? To assist those in need, we have developed a “Whole-Brain Problem Solving” workshop specifically built around the Corrective and Preventive Action requirements in the Standards. In fact, this is the only problem solving approach specifically built around the Corrective and Preventive Action requirements, as far as we know. Visit our Whole Brain site. You will find the “Whole-Brain Problem Solving” method described that can and will provide dramatic improvements for your organization and your career. As the aerospace industry goes through quite a revolutionary change in the standard and auditing methods, opportunities are going to present themselves. You can position your organization to thrive in this time of change or let the change run you down. The tools you will gain the “Whole-Brain Problem Solving” workshop will equip you to succeed. The sixth audit method defined by AS9101 is Continual Improvement and initially it sounds a little like an audit methodology we have seen in the past but it is actually different. We have always had a requirement for continual improvement and most organizations would look around just before an audit to see if there was anything they could point to as a continual improvement. We had to be careful not to select something that looked like a corrective action but something that actually improved something. So again, this audit methodology brings us right back to how we manage our processes. This is indeed the heart of the QMS and the heart of what auditors are going to be looking at. Eagle Force has developed a great tool for identifying, evaluating, and managing your processes. Contact us today. We will be happy to help you succeed. As we have been discussing in previous Guidances, the audit methodology for AS9100, AS9110 and AS9120 is undergoing radical changes. The aerospace industry is intent on ensuring that auditors are actually performing process-based audits. Up to this point the vast majority of audits were not in fact process-based but clause-based. Many registrars are struggling with very high failure rates in the auditor upgrade tests, and in my opinion this is primarily due to the difficulty auditors are having in transitioning toward process-based audits. I was very skeptical that the aerospace industry could actually change the auditors, after all hardly anyone was auditing this way. I was halfway through the transition course myself before I began to believe that it might really happen. A primary reason that clause-based auditing will eventually become extinct ties directly to the audit reporting forms that the aerospace industry has designed. These forms, particularly the PEAR, will force auditors to perform process-based auditing. The PEAR or Process Effectiveness Assessment Report can only be filled out properly as the result of evaluating the effectiveness of an organization’s process. A PEAR must be completed for each production-related process within the organization. Eventually it is expected that every process will have a PEAR. Because it is so drastically different the aerospace industry chose to initially limit the required PEAR’s to clause 7, but you can expect that to expand to apply to your entire system. So what exactly is a PEAR and what is in it? We will discuss that in the next Guidance. As we have been discussing in previous Guidances, the audit methodology for AS9100, AS9110 and AS9120 is undergoing radical changes. The aerospace industry is intent on ensuring that auditors are actually performing process-based audits. One of the primary tools developed to ensure that the audits are process-based and not clause-based is the Process Effectiveness Assessment Report or PEAR. What is a PEAR and what is the purpose? Just as the name suggests it is an audit reporting tool that requires the auditor to make a decision on how effective each of your processes are in meeting the established process metrics and how that ties into the system objectives. It will require that the auditor evaluate each process to ensure that you fully understand and have implemented a process-based management system to focuses on meeting process and organizational objectives and not just addressing clauses of the standard. A quick look at some of the fields in this report is instructive. There are blocks that must be completed by the auditor for each process evaluated. Box eight is simple enough: what is the process name? Like vendor management or design, or metal stamping, or assembly. Box Nine gets right into the meat of the matter: the auditor must record the process description and include the interactions. He or she is going to be looking for your SIPOC, Turtle, or other equivalent information. The auditor is not going to be developing this on-site for you. You need to have it ready. Box Ten requires the auditor to list what aerospace standard clauses apply to that process. Box Eleven requires that the auditor document what method you have in place for determining process effectiveness. He or she must also record how you are monitoring, measuring, evaluating, and managing each process. In coming Guidances we will look at what the auditor is supposed to do with this information. Many CAPAR (Corrective and Preventive Action Request) processes are almost inactive. There are very few corrective action requests and almost no preventive action requests in works. At the same time, if you ask (and we have), “How much time does you organization spend working on problems?” you get some very interesting responses. Having asked this question to hundreds of people, we get responses that range from a low of about 10% to over 60% total time being devoted to problem solving. The next question we ask is, “Are these problems truly new or are they repeating?” Almost universally (99%+) say they are repeating. Unless you can establish that your CAPAR processes are effective in eliminating recurring and avoiding potential problems, your auditor will have no other choice but to judge them “Ineffective”. How much time in your organization is spent working on problems? How much of your time is spent working on problems? Are these problems truly new or are they repeating? If your responses fall in the ranges we’ve experienced it is an indication that you CAPAR processes are not effective. The CAPAR processes will have to become more active and more productive in improving your organization. That is what the auditors are being forced to require in the latest revisions of the Aerospace standards. Be forewarned, auditors will be insisting on CAPAR processes that are effective in eliminating and avoiding problems and that result in higher quality and quicker delivery. Will your CAPAR process meet these requirements? Visit our Whole Brain page. You will find the “Whole-Brain Problem Solving” method described that can and will provide dramatic improvements for your organization and your career. As we have been discussing in previous Guidances, the audit methodology for AS9100, AS9110 and AS9120 is undergoing radical changes. The aerospace industry is intent on ensuring that auditors are actually performing process-based audits. One of the primary tools that has been developed to ensure that the audits are process-based and not clause-based is the Process Effectiveness Assessment Report or PEAR. This is the third part of our discussion on the PEAR. If you missed the first ones, you can find them on our website. The PEAR is the main tool the aerospace industry has designed to insure that organizations are audited and evaluated based upon a true process approach. Registrar’s auditors must use the PEAR and internal auditors should be doing the same, which we will discuss in a later Guidance. In the first two Guidances on the PEAR we discussed what a PEAR is and how it is filled out and evaluated. What we want to look at in this message is how an auditor is supposed to use the results of the PEAR. As aerospace auditors, we were instructed that a #1 is a definite major nonconformance. A rating of #2 is a minor a least, but most likely a major. A rating of #3 will likely not be a finding unless in succeeding audits the condition remains the same or at least not improving. A rating of #4 is obviously fine. In my opinion, the use of the PEAR is very good news for any aerospace/defense organization. In a future Guidance we will discuss why and how this can benefit your organization. As we found out in the previous guidances sent, the revisions to AS standards are going to require a seriously different approach to how organizations handle system effectiveness. In other words, your current system probably won’t meet aerospace requirements without some modifications. The vast majority of organizations are going to need to do considerable work to be successful with these new requirements. Contact us and let us help you. If you missed any of our previous Guidances, go back through and get caught up. Each Guidance contains information you can’t afford to miss. Risk Management Process – Small Companies. One of our senior consultants, Janine Johnson, submitted this Guidance for small companies considering how to integrate Risk Management into their Quality Management System. One of the significant changes in AS9100C is the new requirement for a risk management process. The standard defines this requirement by listing a series of activities that must be considered for this process, shaping the risk management activities into a Plan-Do-Check-Act structure. Many aerospace companies have had a formal risk management process operating as a part of their quality management system for years. Others will struggle to understand this new requirement and spend precious time learning how to use risk management activities effectively. Like all well designed and managed processes, beginning with the end in mind is critically important. Companies with employees already wearing multiple hats need to proceed wisely. The revised AS9100C standard allows an organization to weave together the use of a risk management process, project management and the definitions of special requirements, critical items and key characteristics. Moreover, while the standard requires the risk management activity to be a “process”, the standard does not require this process to be a stand-alone approach. For smaller companies, this translates to embedding risk management into existing product realization processes. The key is to maintain the basic ingredients of risk management, as defined in clause 7.1.2 Risk Management sub-clauses a) – e), and because the requirement states this a “process” we need to also consider the process management approach defined in 4.1 General Requirements. Most CAPARs (Corrective and Preventive Action Requests) deal with corrective actions rather than preventive actions. If fact, many organizations have few to no preventive actions to demonstrate compliance with the requirements of 8.5.3. Why is this? Well the first reason is that corrective actions are like the “squeaky wheel”, they demand attention. Since corrective actions deal with current problems they are the most visible. They may be significant enough that if not solved quickly, the organization will be ground to a halt. On the other hand, since preventive actions deal with problems that have yet to occur, they do not command the same attention as corrective actions – that is until the preventive action occurs and becomes corrective. Corrective actions will come find you. They will chase you down, even into the bathroom. They are hard to ignore. Preventive actions will not find you. You have to find them. It is like an Easter egg hunt. If you don’t look for them, you won’t find them. A corrective action is only a preventive action that went undealt with until it occurred. It is always better to deal with a preventive action than wait for the problem to occur and deal with it as corrective. To assist those in need, we have developed a “Whole-Brain Problem Solving” workshop specifically built around both the Corrective and Preventive Action requirements in the Standards. In fact, this is the only problem solving approach specifically built around the Corrective and Preventive Action requirements, as far as we know. Contact us and we would welcome the opportunity to be part of your success. Don’t gamble with your organization’s success, we have the tools and the experience to equip you to meet these challenges, but contact us today. The clock is ticking. As we have been discussing in previous Guidances, particularly #26-28, the audit methodology for AS9100, AS9110 and AS9120 is undergoing radical changes. The aerospace industry is intent on ensuring that auditors are actually performing process-based audits. One of the primary tools that’s been developed to ensure that the audits are process-based and not clause-based is the Process Effectiveness Assessment Report or PEAR. If you missed any of these, you can find them listed above. Doesn’t it make sense that if the registration audits must radically change, those same auditors are going to be expecting some radical changes in the way your organization performs internal audits? In the next several guidances we will take a look at the way internal audits are being conducted and how they are going to need to change. What’s wrong with the way organizations perform internal audits today? Most internal audit programs never evolved with the management system, and the internal audit program must evolve as the management system matures. Let me explain. In implementing an AS system, an organization develops procedures, flow charts, routers, work instructions, etc., to capture the infrastructure. So initial audits would obviously focus most of their efforts on ensuring the “documented system” met the requirements of the standard. This was often done using a checklist that actually was the standard with check boxes or even the actual organization’s procedures. Eventually an organization turns from development to implementation. The internal audits almost always evolve with this development, and the audits begin to focus on whether the actual practice matches that of the procedure or defined process. These audits are usually supported by check sheets, perhaps even the actual procedures themselves. Rarely does an organization’s internal audit process evolve so that process effectiveness is the primary focus of the auditing. This is the topic of the next Guidance. In the last Guidance we began to discuss how the internal audit process must evolve with the maturity of the management system. The graphs below depict how this evolution should take place. This graph shows the audit emphasis in a brand-new QMS just being set-up. This graph shows the emphasis in a typical QMS ready for initial certification. This graph shows where the audit emphasis should be in a mature system. In the next several Guidances we will be addressing how you might get there. We have gotten overwhelming response to the Guidances that we have been sending for the last six months or so. These messages have been going to thousands of aerospace organizations, commercial, defense, and military and while we are getting feedback and comments this has primarily been a one-way conversation. Even when we did have conversations with organizations regarding some particular topic of interest, no one else could be participate. That is now changing! I invite you to visit our aerospace blog at www.eagleforceinc.com/blog. We created this blog as a community site where everyone can participate. Finally we have a way to hear back from you on how you’re doing with your aerospace upgrade efforts and also to provide a forum for you to share with us and each other tips, questions, comments, and experiences. Our desire is that this blog becomes a resource for you to both get and offer help. If you’re familiar with blogs or comment systems, then you already know how to participate. Jump right in; we’re looking forward to hearing from you. If all of this is unfamiliar to you, visit the link toward the top of this page entitled “How To Use.” There you’ll find quick instructions on how to easily post a comment. Either way, get involved! We really want this site to be a community where people come to find answers, share experiences, and offer insight. Be sure to use the ‘Search’ function in the upper-right of any page to find the subject matter you want to read or talk about. Don’t hesitate to ask questions either. Remember, if you have a question about something, chances are hundreds of others are wondering the same thing. Posting your question allows us all to share knowledge together and work through whatever issues you are facing. We are excited to launch this blog and hope you will take advantage of it as well. While the aerospace industry is expecting many suppliers to have serious issues at the certification audit, our position is that you can and should be successful, but you need to prepare now. Call or contact us and we would welcome the opportunity to be part of your success. Don’t gamble with your organization’s success, we have the tools and the experience to equip you to meet these challenges, but contact us today. The clock is ticking. We have been watching the upgrade process closely and it appears to us like things are going to get wild in the near future. There never was an over-abundance of certified aerospace auditors, even before the necessity to re-qualify for the upgraded standards. There are many thousands of ISO 9000 auditors in America but there are roughly 450 certified aerospace experienced auditors listed in OASIS for the US & Canada and a number of those, like myself, are not actively auditing on a daily basis. When you combine this with what registrars are telling us and that is that auditors are failing to pass the qualification exams at a rate of 20% to 80%, you have a real problem brewing. Many of the older, most experienced auditors are just quitting. I took a quick look at OASIS, the database that lists all the certified companies and all the certified auditors. As I write this, there are 7,317 certified aerospace sites in the Americas of which 180 have successfully upgraded. We are also hearing from the auditors that companies are having a tough time with the upgrade audits, not all of them, but a significant number. When you put all this together with the fact that there are a lot more major nonconformities being written requiring return visits from auditors, it makes you wonder how all this is going to be possible without something changing. We would like to hear from you. What are you experiencing? I invite you to visit our aerospace blog at www.eagleforceinc.com/blog. We created this blog as a community site where everyone can participate. Finally we have a way to hear back from you on how you’re doing with your aerospace upgrade efforts and also to provide a forum for you to share with each other and us tips, questions, comments, and experiences. Our desire is that this blog becomes a resource for you to both get and offer help. As we have been discussing in previous Guidances, particularly #26-28, the audit methodology for AS9100, AS9110 and AS9120 is undergoing radical changes. The aerospace industry is intent on ensuring that auditors are actually performing process-based audits. One of the primary tools that’s been developed to ensure that the audits are process-based and not clause-based is the Process Effectiveness Assessment Report or PEAR. If you missed any of these, you can find them on our website. We have received requests for clarification on the internal audit graphs showing emphasis in an evolving system. So I will take these one at a time and discuss them. In the first graph (shown below) audit emphasis or focus is the y axis and the x axis shows how this emphasis changes over time. The reason the emphasis is on documentation in a brand-new system is that the documentation, be it procedures, flowcharts, work instructions, etc., is just being created. It hasn’t been in place long to enough expect full implementation, hence the lesser emphasis on implementation. At this point there is almost no emphasis on effectiveness. In other words it is pretty hard to evaluate how effective a process is working when it has not been fully defined or implemented. In the next Guidance we will take a look at where most organization’s internal audit programs are at the point of initial certification, as will be represented in the next graph. I invite you to visit our aerospace blog at www.eagleforceinc.com/blog. We created this blog as a community site where everyone can participate. Let us hear from you! Are we covering the issues clearly? Is there a topic you would like to cover? Is there anything you would like to share with the aerospace community? By now you can see, this is a whole different animal than what the previous aerospace audits were about. The aerospace industry is expecting many suppliers to have serious issues at the audits. At Eagle Force, our position is that you can and should be successful, but you need to prepare now. Call or contact us and we would welcome the opportunity to be part of your success. Don’t gamble with your organization’s success, we have the tools and the experience to equip you to meet these challenges, but contact us today. The clock is ticking. As we have been discussing in previous Guidances, particularly #26-28, the audit methodology for AS9100, AS9110 and AS9120 is undergoing radical changes. The aerospace industry is intent on ensuring that auditors are actually performing process-based audits. One of the primary tools that’s been developed to ensure that the audits are process-based and not clause-based is the Process Effectiveness Assessment Report or PEAR. If you missed any of these, you can find them listed above or on our blog. We have received requests for clarification on the internal audit graphs showing emphasis in an evolving system. So I will take these one at a time and discuss them. In this second graph (shown below) audit emphasis or focus is the y axis and the x axis shows how this emphasis changes over time. 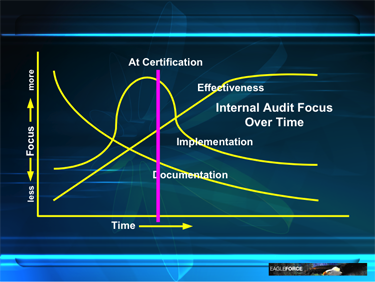 This graph shows the audit emphasis at the time of the initial certification. I have audited hundreds of organizations and this is the stage that we find most internal audit systems. In this stage the emphasis is mostly checking that "we say what we do and do what we say". The checklists most frequently used for internal audit systems in this stage are check lists that focus on implementation. Ask yourself, are your internal auditors focusing on whether the documented system is being followed or whether the actual practices are working effectively? In the next Guidance we will take a look at where the internal audit system should be in a mature QMS and what tools you might provide to help the auditors to perform true system audits that are based upon process effectiveness. We have received requests for clarification on the internal audit graphs showing emphasis in an evolving system. So I will take these one at a time and discuss them. In this third graph (shown below) audit emphasis or focus is the y axis and the x axis shows how this emphasis changes over time. This graph shows the audit emphasis in a mature management system. In a mature management system, which all of you should have if your are currently certified and moving toward the aerospace upgrades, you already know that your system is adequately documented and adequately implemented. You are probably getting very little out of your internal audits by way of major findings or improvements. The moment you switch your audit emphasis to ensuring the processes being audited are operating effectively you will find they will generate a great deal of excitement. Now the audit focus is not trying to find a gage out of calibration or identifying a document that has the wrong revision level or no revision at all, but instead the audit is trying to asses whether that process is working effectively to meet its own established objectives. When is the last time your internal auditors asked the production manager if he was achieving his objectives for hitting his production quota? If he is not, does he have the opportunity to show his corrective action to fix it? If your auditors start writing performance findings instead of conformance findings you will get everyone’s attention. The thing is, this is what your registrar’s auditors are being driven to do. If you change your audit focus to effectiveness, you should not be caught unprepared for the certification upgrade audit. In the next Guidance we will take a look a look at how you might provide tools to help the auditors to perform true system audits that are based upon process effectiveness. As we have been discussing in previous Guidances, particularly #26-28, the audit methodology for AS9100, AS9110 and AS9120 is undergoing radical changes. The aerospace industry is intent on ensuring that auditors are actually performing process-based audits. In the last number of Guidances we have been discussing the importance of your internal audits evolving with the management system. We discussed how in a newly created QMS the audit emphasis is primarily on documentation, but how that should rapidly evolve to implementation. Little emphasis is expended on effectiveness since that system is just being implemented. Unfortunately, most internal audits never evolve beyond auditing for implementation and actually the certification audits never did either. But in a mature management system, which all of you should have if you are currently certified and moving toward the aerospace upgrades, you already know that your system is adequately documented and adequately implemented. Your internal audit focus needs to be on effectiveness. The changes to AS9101 rev D not only show how the aerospace industry is expecting registrars to move beyond implementation (conformance) to effectiveness (performance) but give us some pretty good ideas of how to equip our internal auditors to do the same. Your internal auditors ought to be using all six of the recommended audit methods defined in AS9101. You can find these methods covered in Guidances 15 thru 24, if you missed them you can find them on our blog. A good test of whether your internal auditors are performing process-based effectiveness audits is whether the auditor can adequately complete a PEAR form based upon his or her audit results. I invite you to visit our aerospace blog. We created this blog as a community site where everyone can participate. Let us hear from you! Are we covering the issues clearly? Is there a topic you would like to cover? Is there anything you would like to share with the aerospace community? We are working with aerospace companies around the country helping them prepare for the upgrade audits that are coming. The topics most companies are concerned with are Risk Management, Project Management, and the expanded Configuration Management requirements. While these are legitimate concerns and we are about to launch an e-learning course on Risk Management, the primary issue seems to have escaped the notice of most organizations: process management. The heart of the new audits is the process approach: identifying your processes, their sequence & interaction, defining the criteria for effectiveness, measuring & analyzing the results, and taking corrective or continual improvement actions. The amazing thing to me is that there just isn't anything better an organization can do to improve its competitive advantage and yet it is completely missed in the upgrade activities. My business partner, Bill Houser, Eagle Force's president, has long insisted that if you create your management system to meet the standard, it may or may not meet your business needs, but if you create the management system to meet your business needs, we'll make the argument that it meets the standard. In all these years, that maxim has never failed. If you do this right and truly create a process based management system that meets your business needs you will have no problems with any audits and your senior management will line up to fully support it. Online Risk Management Course Now Available! Initial feedback is showing that organizations are struggling to effectively meet this requirement and especially trying to do it in a way that actually makes business sense. We have gotten many requests for training or tools that can help with this requirement. After seeing how few resources exist that provide meaningful help, we decided to create an online Risk Management Course that not only meets the 7.1.2 requirement but extends well beyond. You will quickly discover the primary focus of this course isn’t simply satisfying 7.1.2. Instead, the course teaches you how to effectively manage and mitigate risk in a way that actually benefits your organization. And as a result, the 7.1.2 requirement is met. This is the first truly effective online course to help you with Risk Management! Next week, August 18th, the online Risk Management program will be available! In a clearly presented online course the Risk Management program is explained in easy to understand and easily applied principles. The course includes all the forms and a sample Risk Management procedure for you to adapt for your own needs. Next week we will be posting the login instructions for this new, dynamic course! Stay tuned for more details. Guidance #41: Online Risk Management Course Now Available! The online Risk Management training course is now available! In a clearly presented online course the Risk Management program is explained in easy to understand and easily applied principles. The course includes all the forms and a sample Risk Management procedure for you to adapt for your own needs. We have deliberately kept the cost low so that this course can be available to all. Click on this link to go to this new, dynamic course! I also invite you to visit our aerospace blog. We created this blog as a community site where everyone can participate. Let us hear from you! Are we covering the issues clearly? Is there a topic you would like to cover? Is there anything you would like to share with the aerospace community? Guidance #42: Online Risk Management Course Now Available! We have been sending these Guidances to thousands of aerospace/defense organizations for nearly a year and have gotten many thankful responses. We have had the opportunity to help a lot of companies. We get contacted nearly everyday from companies struggling to understand and meet the requirements of the upgraded standards asking us what can we do to help them. I thought I would take this opportunity to tell you what we recommend. Eagle Force is a full-service consulting/training firm and we can do it all for you, but that is rarely necessary. What most organizations need is to have some guidance and coaching to ensure that they are on the right track. If you do this right you can take advantage of the changes being driven by these standards to really improve the way your organization operates. Our job is to help teach you how that works. We almost always start this with a gap analysis/planning visit in which we both evaluate where your organization is versus where it needs to be and teach the main principles and methods needed to achieve success. This one to two day on-site visit is a stand-alone service that can set you up for success and avoid costly mistakes. Some organizations need only this to get them over the finish line, others want further support such as internal auditing, training in risk management, or documentation support. Every Eagle Force client has been very glad they had the gap analysis/planning visit, I think you would be also. Log onto our website at www.eagleforceinc.com and ask about the gap analysis/planning visit. Don’t forget, we have a great online Risk Management training course complete with sample procedures and forms available on our website. It is very inexpensive but very effective. Check it out at www.eagleforceinc.com/riskmanagement. We have been keeping our ear to the ground to see how organizations are doing with the upgrade audits and we are seeing some interesting but not particularly surprising results. There are about 7,480 organizations in America that need to upgrade their certifications. To date only 445 have been successful. Even some of the successes are recognizing that they need to continue to modify their management systems to remain certified. The word we are getting from registrars, auditors, and organizations that are going through this process is it is not going well. This is not surprising since very little was done to help organizations to understand what was really changing. The major changes are not found in the new revisions to the standard; they are found in fully integrating the Process Approach (which you can find discussed in detail in previous Guidances on our website). We are talking to organizations daily regarding getting their systems ready and what we are finding in nearly every case is that the Process Approach is not currently understood nor effectively implemented. If you would like to have some help with this to ensure that your organization does not experience what many are, contact us. We are the best in the business at helping organizations develop aerospace management systems that not only meet the standard's requirements but also make business sense. We have auditors on staff that not only have taken and passed the upgrade exams but are the actual instructors for those courses. Don't wait until this becomes a hair-on-fire issue, contact us today. If you are running out of time or are even one of the organizations that has gotten clobbered in an audit, call us. We can help you get through this. We can help you get the nonconformities addressed and closed. You don't need to lose your certification. By now you can see, this is a whole different animal than what the previous aerospace audits were about. The aerospace industry is expecting many suppliers to have serious issues at the audits. At Eagle Force, our position is that you can and should be successful, but you need to prepare now. Call us or visit our website at www.eagleforceinc.com/as9100.html and we would welcome the opportunity to be part of your success. Don’t gamble with your organization’s success, we have the tools and the experience to equip you to meet these challenges, but contact us today. The clock is ticking. As most of you know we have been watching and keeping you up to date on the progress of the upgrade audits. This week I met with the aerospace sector manager for one of the world’s largest registrars and he gave me some valuable information that I thought I would pass on to you. He indicated that about 50% of the organizations upgrading to the new requirements are having major difficulties in the audits. Some haven’t prepared at all! A great many are experiencing multiple major nonconformances and are in danger of losing their certification. There are three primary areas that the organizations are struggling with: 4.1, 7.1, and 7.4.1. I thought it might be helpful if your are trying to get ready, to discuss these three clauses and what to expect. In the next several Guidances we will cover them one at a time. One of the areas that we knew was going to be an issue was the Risk Management Process. We created a very effective, low cost, online course that will not only teach you how to be successful here, but also give you a sample Risk Management procedure and the forms. Click on this link to go to this new, dynamic course! By now you can see, this is a whole different animal than what the previous aerospace audits were about. While it is true that many in the aerospace industry are experiencing serious issues in the upgrade audits, at Eagle Force, our position is that you can and should be successful, but you need to prepare now.We would welcome the opportunity to be part of your success. Don’t gamble with your organization’s success, we have the tools and the experience to equip you to meet these challenges, but contact us today. The clock is ticking. There are three primary areas that the organizations are struggling with: 4.1, 7.1, and 7.4.1. I thought it might be helpful if you are trying to get ready, to discuss these three clauses and what to expect. In the next several Guidances we will cover them one at a time. In this Guidance we want to take a look at the primary area that organizations are getting nonconformances: 4.1, the process approach. By definition these findings are almost always major nonconformances. Our experience is that hardly any organizations intuitively develop their systems around the process approach so unless they have had some additional training they are headed for an unpleasant experience. Ironically, few efforts will reward an organization more that adopting the process approach. The key here is to link the processes with the organization’s objectives, define how the processes are being measured in effectively accomplishing these objectives, and taking action to fix/improve those processes based upon those metrics. We covered in some depth the process approach in Guidances 1-10, 17, & 22 which are available for your review on our website, see above. If you review those Guidances there should be no surprises for you in your upgrade audit. By now you can see, this is a whole different animal than what the previous aerospace audits were about. While it is true that many in the aerospace industry are experiencing serious issues in the upgrade audits, at Eagle Force, our position is that you can and should be successful, but you need to prepare now. We would welcome the opportunity to be part of your success. Don’t gamble with your organization’s success, we have the tools and the experience to equip you to meet these challenges, but contact us today. The clock is ticking. As most of you know we have been watching and keeping you up to date on the progress of the upgrade audits. A couple weeks ago I met with the aerospace sector manager for one of the world’s largest registrars and he gave me some valuable information that I thought I would pass on to you. He indicated that about 50% of the organizations upgrading to the new requirements are having major difficulties in the audits. Some haven’t prepared at all! A great many are experiencing multiple major nonconformances and are in danger of losing their certification. There are three primary areas that the organizations are struggling with: 4.1, 7.1, and 7.4.1. I thought it might be helpful if you are trying to get ready or have had problems in your audit to discuss these three clauses and what to expect. In this Guidance we want to take a look at clause 7.1 which has had some significant changes. The purpose of clause 7.1 is to ensure effective planning for a new job, model, or process so that you can deliver good product, on time, at the price you quoted. The aerospace industry has specifically defined four areas of attention in this clause: 7.1.1 Project Management, 7.1.2 Risk Management, 7.1.3 Configuration Management, and 7.1.4 Control of Work Transfers. Project Management, 7.1.1, requires that you have a structured and controlled method for this planning process. You must define how this process works and there must be evidence that it is controlled, in other words, objective evidence that you are following the process. For those with experience with automotive the APQP process is an excellent example of project management. In the coming weeks Eagle Force will have an online learning course available on our website for Project Management. Risk Management, 7.1.2, is a source of many of the findings being issued in the audits. Risk Management requires a formal process for identifying, qualifying, mitigating, and accepting risks to the delivery of good product, on time, and at the price quoted. We have created a very effective, low cost, online course that will not only teach you how to be successful here, but also give you a sample Risk Management procedure and the forms. Click on this link to go to this new, dynamic course! Configuration Management, 7.1.3, expands on the requirements that used to be in clause 4.3. See Guidance #14 on our website for a discussion of what the configuration management requirements are and how you might meet them. Control of Work Transfers, 7.1.4, expands on the requirements that used to be in clause 7.5.1.4. The significance here is that it was moved from not just how you control work being transferred from you to a supplier, or from one of your facilities to another, or one supplier to another, but how do you plan for this? It is now in 7.1, the planning phase. In the next Guidance we will look at Purchasing, particularly what the auditors are writing up and why. Our reason for existing is to help you create/improve a management system that makes business sense as well as meets the requirements of the standard. Contact us and we would welcome the opportunity to be part of your success . As most of you know we have been watching and keeping you up to date on the progress of the upgrade audits. In the past few updates, I’ve been talking about some interesting and startling information I received from the aerospace sector manager for one of the world’s largest registrars. To recap, about 50% of the organizations upgrading to the new requirements are having major difficulties in the audits. Some haven’t prepared at all! A great many are experiencing multiple major nonconformances and are in danger of losing their certification. The three primary areas organizations are struggling with are 4.1, 7.1, and 7.4.1. Last time we looked at clause 7.1. Go review it on our website (link provided below) if you missed it. It contains vital info you don’t want to miss. In this Guidance we want to take a look at clause 7.4.1, which has had some significant changes. The purpose of clause 7.4.1 is to ensure effective management of your suppliers. Two new areas are apparently tripping folks up and so we would like to discuss them here. First, clause 7.4.1 a) adds that the organization shall maintain a register of it’s suppliers (AVL) that includes approval status and the scope of approval. In revision B it did not specifically say “approval status”, in rev C it does. This was a surprise to me because it seems obvious that a supplier would not be on the AVL if they weren’t approved, but that is not how auditors are interpreting this. Be careful here; your approved vendor list must indicate the actual status (e.g., approved, conditional, disapproved) and the scope of approval (e.g., product type, process family). In the next Guidances we will look at the new AS9100 Auditor Guidance Document that the International Aerospace Quality Group (IAQG) has just released. It tells the auditors what specifically to look for and I thought it might be nice if you knew also. Our reason for existing is to help you create/improve a management system that makes business sense as well as meets the requirements of the standard. Contact us and we would welcome the opportunity to be part of your success. In this guidance, I’d like to show you a couple practical ways you need to use your internal audits to be successful in the coming transition audits. As most of you know we have been watching and keeping you up to date on the progress of the upgrade audits. In the past few updates, I’ve been talking about some interesting and startling information I received from the aerospace sector manager for one of the world’s largest registrars. To recap, about 50% of the organizations upgrading to the new requirements are having major difficulties in the audits. Some haven’t prepared at all! A great many are experiencing multiple major nonconformances and are in danger of losing their certification. In the last several Guidances we were discussing some of the major problem areas cropping up in the upgrade audits. We were about to start looking at a brand new document just released regarding what auditors should be looking for when a new issue has surfaced. As everyone is fully aware by now, AS9100, AS9110, and AS9120 are completely different from anything we have seen before. It stands to reason that an organization should have conducted a round of internal audits of the newly revised systems. In your upgrade audit, if the auditors discover that you have not conducted internal audits to the revised system using qualified internal auditors, it will result in a major nonconformity. Be sure to conduct a complete round of internal audits using process-based internal audits that are really focusing on clause 4.1 a thru f. Also be sure that your organization deals effectively with the internal audit findings. It used to be that if you found an issue in your internal audits the auditors would give you some slack because you were dealing with the issue. They are not allowed to continue that practice. We have gotten many requests from you that you would like to take the Risk Management course but pay for it using a company purchase order. We are happy to tell you that we have revised the payment methods for the course to now include using a company purchase order instead of a credit card if you so desire. As most of you know we have been watching and keeping you up to date on the progress of the aerospace upgrade audits. The International Aerospace Quality Group (IAQG), which of course manages the aerospace certification process, has released an auditor guidance document that helps auditors know what to ask and what to look for. I thought it might be a good idea if you also knew what the auditors are being told so you won’t be blind-sided in your upgrade audit. In the introduction to the guidance, the IAQG instructed aerospace auditors to perform process audits by using the following approach. I copied the following paragraphs right from the auditor guidance document. Is the process identified and appropriately defined (inputs, outputs, resources & controls)? Are responsibilities of process owner and process performers assigned? What is the process? What is it trying to achieve? Who is the customer of the process? Does the process address applicable customer specific requirements? Does it reflect specified customer targets / performance requirements? What are the measures (key performance indicators, etc.)? Is the process performance regularly reviewed by Top management? Where performance is not being achieved, are improvement plans in place? In the next several Guidances we will look at some of focus areas the IAQG is pointing the auditors to look at and how what you might be expected to show them. If out of target, how is this analyzed? How are actions taken? The use of “Turtle diagram” or SIPOC approach is a means of compliance : description of input, output, process, resources, method, measurements. Detailed processes needed for product realization are specific to each organization. Examples of such processes are: Marketing and Sales, Purchasing, Production Planning, Parts Manufacturing, Assembly, Warehousing (both of incoming material but also finished products), Maintenance, Design and Development, Delivery, Incoming goods, and Product Support. If you need help or just want a sanity check, contact us. Our reason for existing is to help you create/improve a management system that makes business sense as well as meets the requirements of the standard. Call us or visit our website at and we would welcome the opportunity to be part of your success. As most of you know, we have been watching and keeping you up to date on the progress of the aerospace upgrade audits. The International Aerospace Quality Group (IAQG), which of course manages the aerospace certification process, has released an auditor guidance document that helps auditors know what to ask and what to look for. I thought it would be helpful for you to have an idea of what the auditors are being told so you won’t be blind-sided in your upgrade audit. Risk management is appropriate to the organization and the product. The method should ensure the identification of all risks liable to disrupt the operational/industrial process and/or achievement of customer expectations. The concept of risk can be viewed from two perspectives: Risk management process can be applied at various levels in an organization (organization, project, process, product, etc.). It can be a stand alone process or integrated into key points of the organization’s realization processes. Risk based decisions: once risks are identified (7.1.2.c) from various potential sources (customer, organization, statutory/regulatory, etc.) the risks need to be communicated to various departments or individuals within the organization. As this risk communication is received, an assessment of these risks should be performed to determine potential impacts. As you can easily imagine an area of major findings is the Risk Management process. Eagle Force saw this coming and we developed an online course specifically to address this concern. The course will quickly teach you how to create and apply a Risk Management process that meets the criteria of the new standard while providing real benefit to your organization. The course comes complete with a sample Risk Management procedure and accompanying forms. The course is fast, easy to learn, and very inexpensive. 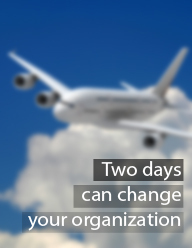 At $295, your organization cannot afford to miss it. Remember, under the new standard, most organizations are going to really struggle to meet the Risk Management requirements if they do nothing to prepare. We designed this course to rapidly equip you with the tools you need to meet the requirements. Learn more about it on our Risk Management page. As most of you know we have been watching and keeping you up to date on the progress of the aerospace upgrade audits. The International Aerospace Quality Group (IAQG) which of course manages the aerospace certification process has released a auditor guidance document that helps auditors know what to ask and what to look for. I thought it might be a good idea if you had an idea of what the auditors are being told so you won’t be blind-sided in your upgrade audit. When traceability is a requirement, traceability level of the parts depends on the part category (e.g., the critical ones should be traceable from the raw material to the assembly, the part should always be with its SN during the production, in addition all the manufacturing history should be recorded). Also, see ISO 10007. Guidance #55: New Change To Deadline!! As most of you know we have been watching and keeping you up to date on the progress of the aerospace upgrade audits. The International Aerospace Quality Group (IAQG), which of course manages the aerospace certification process has been keeping a close eye on all this. The IAQG’s Other Party Management Team (OPMT) released some startling numbers at last week’s meeting in San Diego. It was expected that 65% of the aerospace supply base would have completed transition and received and upgraded certificate to the new standards by this point, however to date only 24% have completed transition successfully upgraded. This has very likely created a massive logjam of organizations needing to still achieve the upgrade complete transition prior to the July deadline. This does not appear likely to occur. The 01 July 2012 target remains in place but the suspension process will be utilized in lieu of withdrawal. The previous revision of the 9100/9110/9120 standards will not be cancelled on 01 July 2012; standards cancellation will occur in 2013. Certified organizations that have not had their on-site audit activity to the 9100/9110/9120:2009 AQMS standards completed by 01 July 2012 shall have their certificate suspended. Suspension status will remain in effect until transition is completed or the certificate is withdrawn. There will be no 9100/9110/9120:2009 transition audits after 01 Jan 2013. Failure to complete the on-site audit activity to the 9100/9110/9120:2009 AQMS standard by 01 Jan 2013 shall result in certificate withdrawal from OASIS. Should an organization's certificate be withdrawn then the initial certification process must be completed before a new certificate can be issued. The complete updated Supplemental Rule SR-001 can be downloaded via the log on page of the OASIS database. Roger Ritterbeck, the North American Aerospace Product Manager for Bureau Veritas (a CB) said that this ruling is significant because what it means in plain English is that as long as the on-site audit has taken place before the deadline, July 1, 2012, it will not result in a suspension even though there may be open nonconformities. Previous to this ruling the requirement was that the upgrade audit had to be completed, all findings closed, certificate issued and OASIS listing revised. This would have required an organization to safely schedule their audits months before the deadline to ensure closure on any findings nonconformities. This change should take considerable pressure off the supply chain and registrar capacity. I spoke at some length to with Tim Lee, the IAQG OPMT Chairman, who confirmed that Roger was correct in his understanding. Tim also added that while it is not necessary to close audit findings prior to July 1 deadline in order to avoid suspension, the OPMT would be expecting registrars to ensure that those findings would be closed within normal timeframe of at least ninety-days from issuance. Tim also stressed the importance of getting the audits done as quickly as possible and not taking this as a license to procrastinate. Requesting a change to existing audit schedules based on the SR-001 revision may put certified organizations at risk of suspension due to the availability of auditor resources as we approach the 01 July 2012 target date. This ruling should have a profound effect on the success of the transition of the aerospace/defense industry as a whole and could specifically effect your plans. I hope that it helps you. If you have any questions regarding what all this means, your registrar should be able to help. You are always welcome to ask us here at Eagle Force and if we don’t know it, we’ll do our best to find out for you. As most of you know we have been watching and keeping you up to date on the progress of the aerospace upgrade audits. The International Aerospace Quality Group (IAQG) which of course manages the aerospace certification process has released a auditor guidance document that helps auditors know what to ask and what to look for. I thought it would be helpful for you to have an idea of what the auditors are being told so you won’t be blind-sided in your upgrade audit.